Water that washes off your property into the storm drain — stormwater runoff — doesn’t go to a treatment plant. It often goes straight into our streams. Storm drains can become clogged with excess leaves, tree branches and trash, which can lead to storm drain back-ups that flood streets, your yard, and possibly your basement! Trash and contaminants that flow from storm drains into our local streams eventually flow into rivers including the Potomac, which empties into the Chesapeake Bay. It may not seem like a big deal, but you can do a lot to keep our waterways clean just by being sure to tidy your yard, dispose of trash properly, cleaning up after your dog, and by encouraging your neighbors to do the same. Keep a tight lid on your trash cans and recycling bins, especially during windy days. Only rake leaves into the street if the county offers a leaf vacuuming program in your area. Don’t blow lawn clippings into the street. Direct them onto your property so they can be added to your compost bin or bag them for pickup by the county. Limit use of sand and salt on your driveway and walkways. Sweep up residual sand once the snow and ice has melted and before the next rain storm, so the sediment doesn’t end up in the stream. Pick-up after your dog! Stormwater will pick up the waste and wash it into the storm drain and nearby streams. Pet waste contains harmful bacteria that impact stream wildlife and water quality. Limit fertilizer, pesticide, and herbicide application. It is illegal to allow pollutants to flow into a storm drain. If you see someone dumping or not containing pollutants report it. 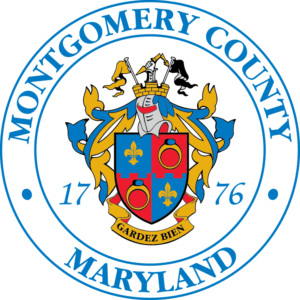 Organize your group and volunteer in Montgomery County's Adopt a Road Program. Storm drain markers help educate the public about our storm drain system. The storm drain markers are installed quickly and easily using permanent adhesive. You can help educate others and change behavior in your community by organizing a storm drain marking project. Get support from the County's Storm Drain Marking Program and the materials to mark drains, including adhesive. The markers remind people that street litter flows directly into local waterways.